d | The Dark Side of Digital Art. The Entic are another race that occupies the Universe of Savaged. Original I had no idea what I wanted them to look like, or how they were going to function. 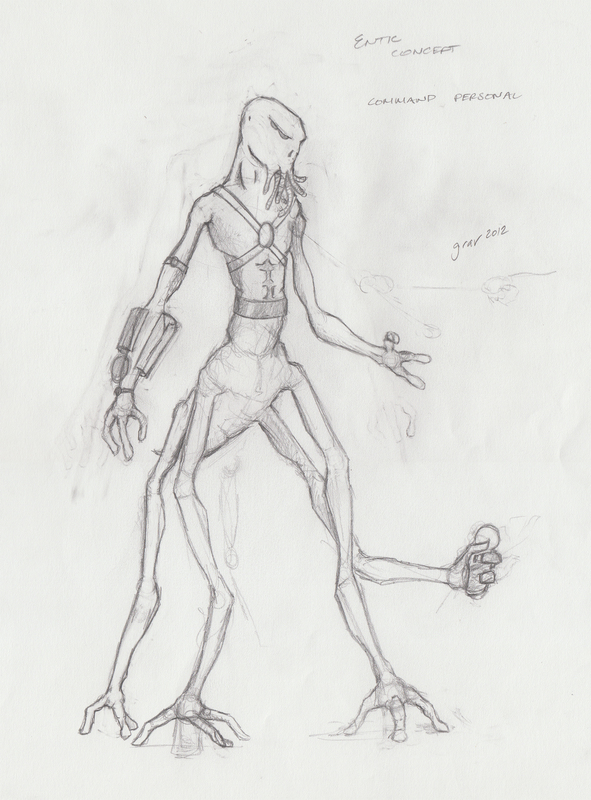 I wanted them to look as alien as possible, having as little comfortable similarities with humans as possible. They are dangerous, driven and very enigmatic race. This first sketch is really just a collection of ideas, which led to how they developed even further. Figuring out the how and mechanics of how the Entic would move helped a lot in the final outcome of how they looked. Three fingered hands and feet, an insectiod like configuration, allowing them to move swiftly and efficiently. I wanted these guys to be able to tackle a human, and wrap their fingers around a humans neck, and hold them down. A terror tactic that works with their anatomy and savage society. I have yet to really design their culture or worlds, or technology.